Pause over that formulation: The heartache, following the slaughter of school staff and children at Sandy Hook Elementary school, was “caused by the gun…” Surely, the primary rifle used by Adam Lanza as he mowed down innocent students and staff, the AR15, later proscribed on a list of weapons banned in Connecticut by the General Assembly, was neither the efficient or proximate cause of the heartache or the slaughter. Were that the case, guns rather than people would be put on trial every time a murder had been committed in Connecticut. In the entire history of "The Provision State," there is not one record of a murder weapon having been convicted in a crime. One has to reach back to pre-literate days to find such a case. In his monumental study of homeopathic magic, Sir James George Frazier in “The Golden Bough” mentions a relevant instance in which an accused murderer is put on trial. Cross examined by the elders of a primitive village tribe, the man admits to the murder. The assault weapon he had used to commit the crime, a knife, is then called to testify, pronounced guilty and tossed into a nearby river. Mr. Frazier does not mention whether the knife was sufficiently represented by council. Even today, more than two years after this heartrending crime had occurred, we are still disputing the triggering cause of the slaughter. We know who the murderer was, but what moved him to commit the crime? Was Mr. Lanza mentally disturbed? Was he on or off his meds? Could there have been a successful intervention? These tormenting questions aside, no one in the state of Connecticut has a shred of doubt who committed the crime – and it was not the AR15, which appears to have been suitably punished, along with every innocent owner or prospective owner of the proscribed weapon. So many questions, so few definitive answers; but not all the questions are imponderables. One question presently before us is: Are the most recent measures taken by President Barack Obama to reduce gun crimes in the United States sufficient to reduce gun crimes in the United States? Even Mr. Obama believes his Presidential edict is insufficient. And U.S. 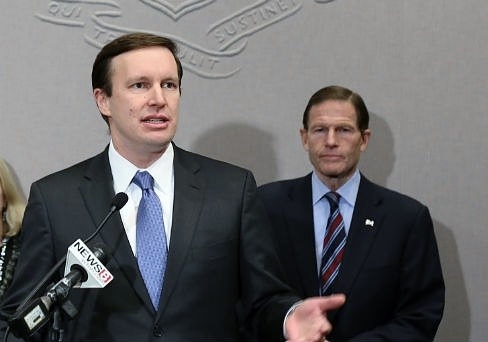 Senator Chris Murphy, perhaps the loudest and most persistent voice in favor of gun control in the nation, has said Mr. Obama’s measures are insufficient. The Courant itself points to the single major failing of the Presidential executive order on gun control: The executive orders of Mr. Obama can easily be undone by countervailing executive orders issued by succeeding Presidents. The co-operation of Congress is essential in making laws. The American Republic much battered by the imperial edict driven Presidency of Mr. Obama, never-the-less retains its stature as the most successful and powerful representative body in the 21st century. Way back in August, Mr. Murphy asserted in an interview with CNN’s Poppy Harlow that the Congress was not likely to pass laws that would stop shootings. He also asserted, and continues to assert, that a Congress that will not consider such bills as have been passed in Connecticut is complicit in mass murders, because Congressional inaction enables a culture of violence. Even small changes enacted by Congress, Mr. Murphy said, would have a salubrious effect on the culture of violence in the United States. Truly, we live in dangerous times. It may be important to point out that Governor Dannel Malloy – who took the trouble of submitting his gun control measures to Connecticut’s legislature -- has given his unqualified support to Mr. Obama’s Presidential edict. Mr. Malloy signed a law in 2012 passed by Connecticut’s Democratic dominated General Assembly that abolished the state’s death penalty – even in cases of mass murder such as occurred in Sandy Hook. Democrats in the General Assembly and Mr. Malloy argued that the death penalty for heinous crimes was not a deterrent, causing one commentator to propose that all punishments perhaps should be abolished. Others argued persuasively but unavailingly that the death penalty should be mended, not ended. Is it not possible that stupidity on the part of governors, presidents and legislators, rather than the presence of guns among our law abiding citizenry, may be the principal culprit advancing the culture of violence in the United States?